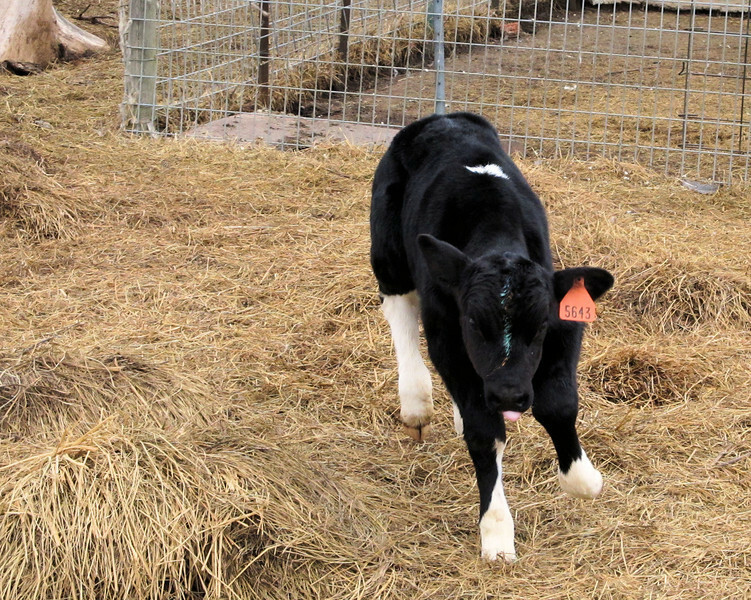 Leaping as much as a 10 day old calf can, who spent the first week of its life lying around hardly able to stand up let alone walk and run. After I got him home at 4 days old and a ride of between 6 and 7 hours, he never thought much of eating and the next day I used a turkey baster to feed him 4 times. The next day he found his sucking reflex, though it would tire him out real fast. When he started standing his front legs would bend out to the side in a sideways V. But after walking him out into the pasture a couple days, a couple times a day, they strengthened up fine and stay straight now. I never had hopes that he would be running around so fast. He still spends a good part of the day sleeping but he livened up enough so I can put in a real picture of kind of a “Leap”.